After all the cookbook cooking this summer, I’ve fallen into somewhat of a rut with my dinners. I was on such a roll with the creativity that now I’ve been making the same thing over and over again, which leads to boredom and ordering delivery. In an effort to get my creativity juices flowing again, I decided to start with one of the most unusual types of spiralized veggies: broccoli stems. As you saw in this post, it is possible to spiralize broccoli. Actually, it’s a lot easier than it looks. While broccoli noodles can be used in full-fledged pasta dishes, I prefer them as an addition to a meal, such as a stir fry ingredient. Today’s recipe has saved me from my rut – it’s flavorful, has a lot of texture and fills you up more than most typical pasta dishes. The steamed broccoli noodles have a subtle, well, broccoli-like taste, which is warm and delicious. Oh, and did I mention that the feta gives this dish a savoriness that’s irresistible? I found myself dipping my fork in the extra dressing, after I made this recipe and sat down to taste test it. If you are a vegetarian, skip the chicken and add in extra chickpeas! Speaking of vegetarian, I’ve been eating vegetarian for 2/3 of my meals lately and I’ve been feeling better than ever. Not that I was ever feeling poorly, but I feel lighter, happier and more energized. Duh – veggies are great for you! 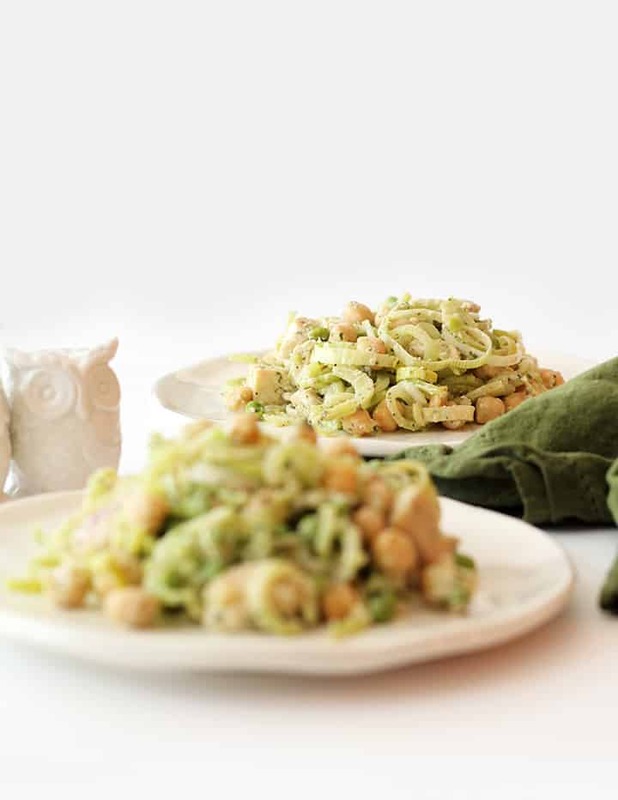 Whether you’ve been in your own dinner rut or not, make yourself a plate of this “pasta” and you’ll be rejuvenated! Remember, here’s how to spiralize a broccoli stem. 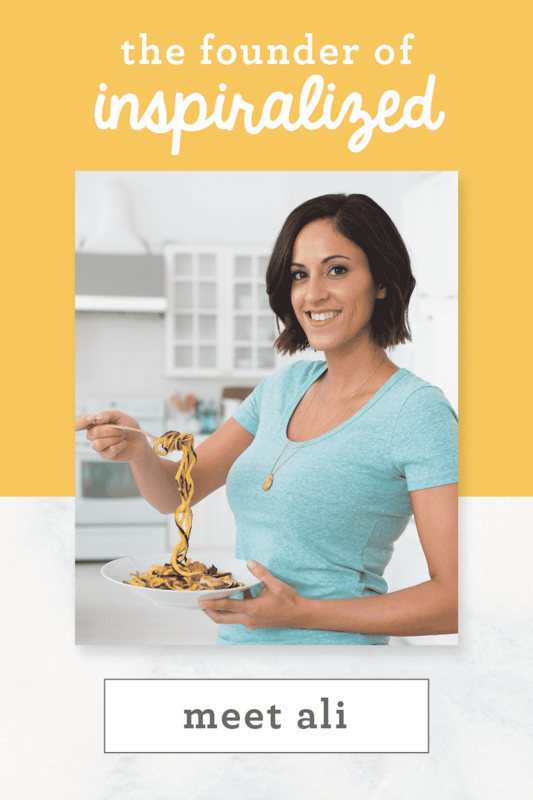 Have you entered into the spiralizer giveaway? There’s still time left! 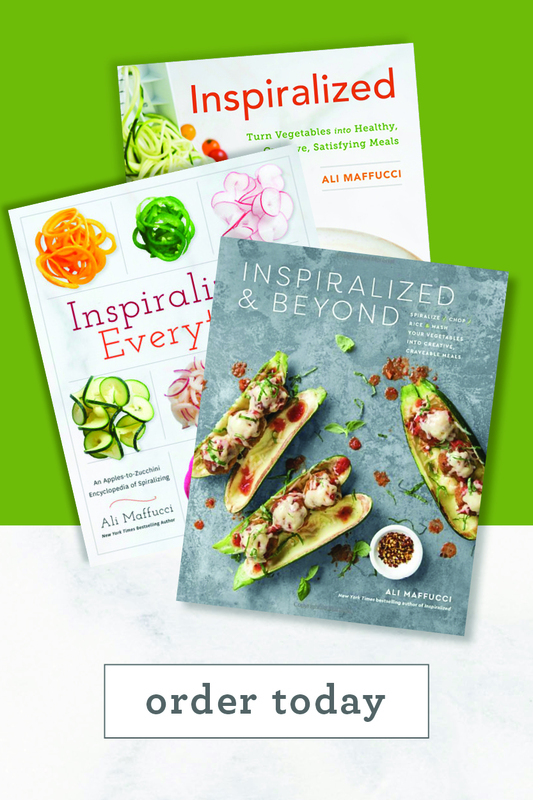 Paderno is offering 3 lucky Inspiralized readers one of their new 4-blade Spiralizers! Open to US addresses only. To enter to win, use the widget below. Good luck! 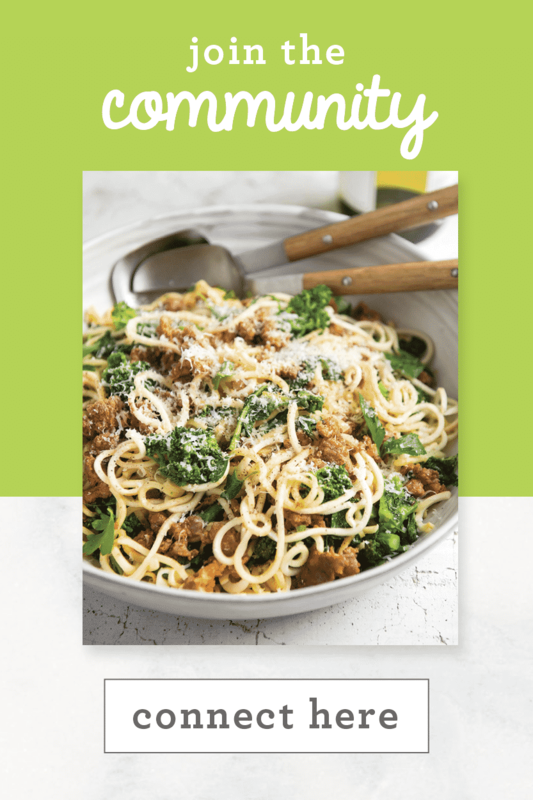 Of course, if you can’t wait to find out if you won or not, click here to purchase the newest Paderno spiralizer. Place a large skillet over medium heat and add in the olive oil. Meanwhile, season chicken with salt, pepper and oregano on both sides. Once oil is shimmering, add in the chicken and cook until no longer pink. Set aside. Place a medium pot filled halfway with water over high heat and bring to a boil. Once boiling, add in the broccoli noodles and peas and cook for 2-3 minutes or until the broccoli noodles are softened and cooked to al dente and the peas are bright green. Drain and set aside. 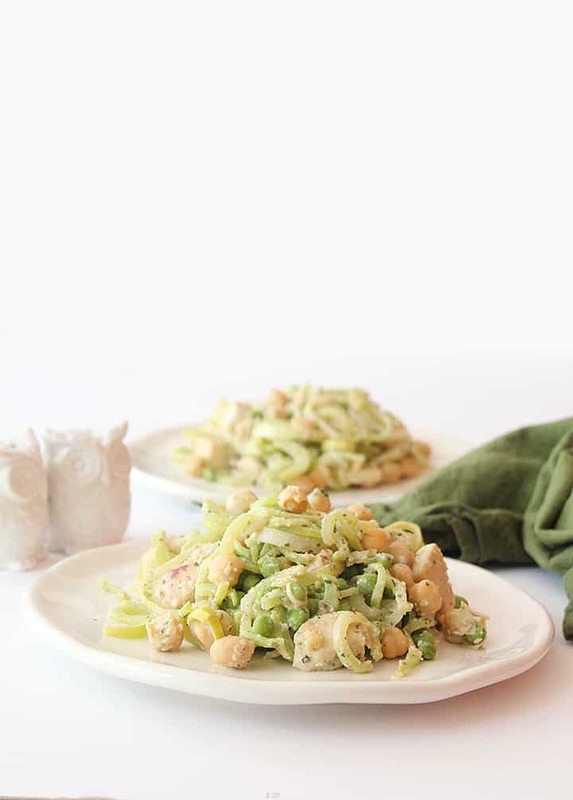 While broccoli noodles are chilling, place all of the ingredients for the feta dressing into a food processor and pulse until creamy. 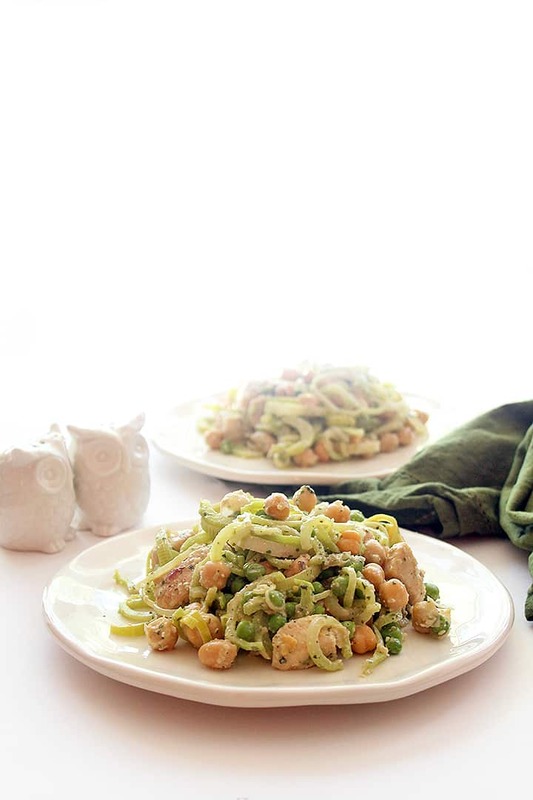 Place the broccoli noodles, chickpeas, peas, leeks and dressing in a large bowl and toss to combine. Brilliant idea with the broccoli stems!! Having a hard time with spiralizing the broc. I guess I need more practice. 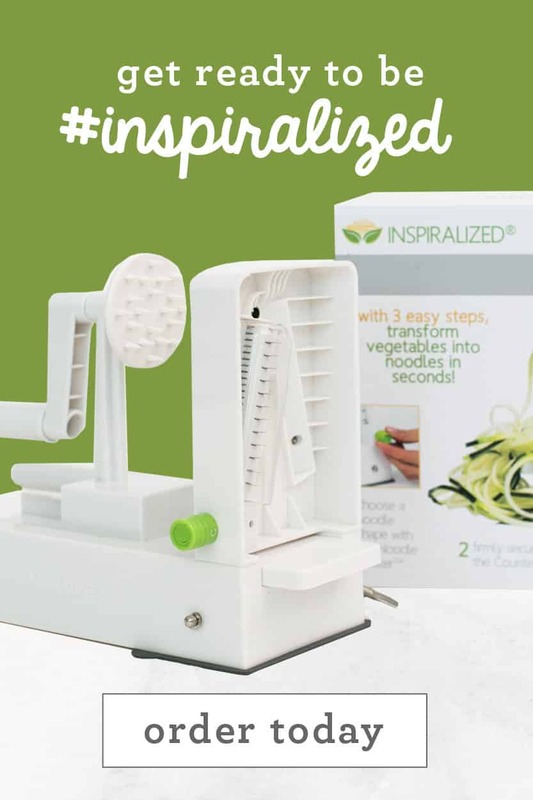 Excited to win the spiralizer! Wondering how much broccoli stem is left? With my spiralizer, there's a fairly large core that is lost? It's false! Also, just think back on all of the historical uses of olive oil in Mediterranean cuisine - a healthy, long-living people! Hi Ali, I can't eat dairy. Could you substitute avocado instead of the cheese when making the dressing? Kim - the feta is what gives this vinaigrette its special flavor, but you can definitely make a different dressing using avocado - just make sure to add extra salt to the dressing or throw in some olives for extra saltiness! 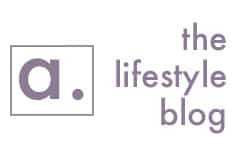 I love using the spiralizer and can't imagine it being any better:) but am looking forward to seeing it myself!! 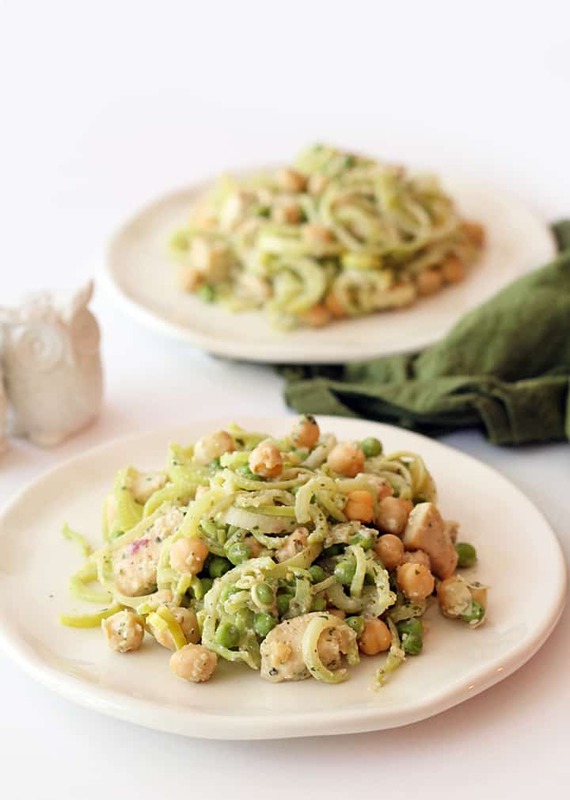 We really enjoy the zucchini noodles with pesto. This recipe looks amazing, can't wait to try! 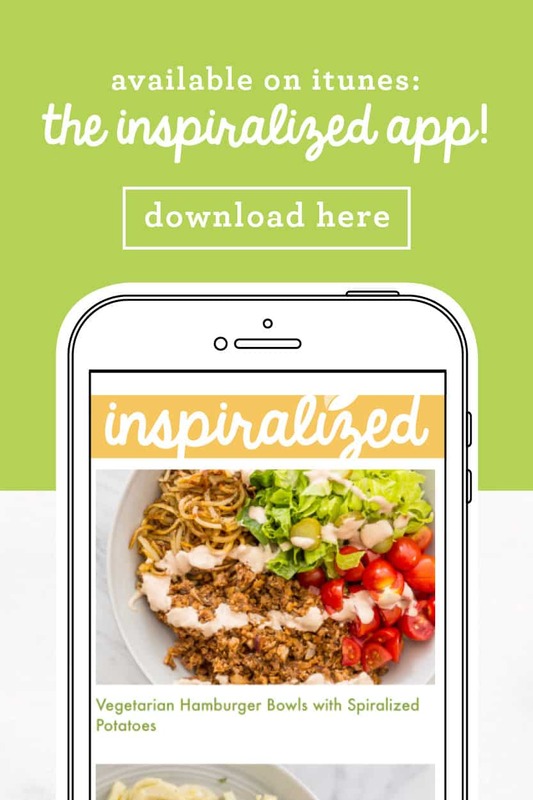 I'm so happy to have come across your website, I've learned so many new things to do with my spiralizer. Thank you! 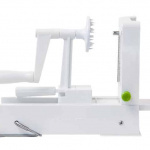 I am interested in the new blade storage of the 4 blade spiralizer. 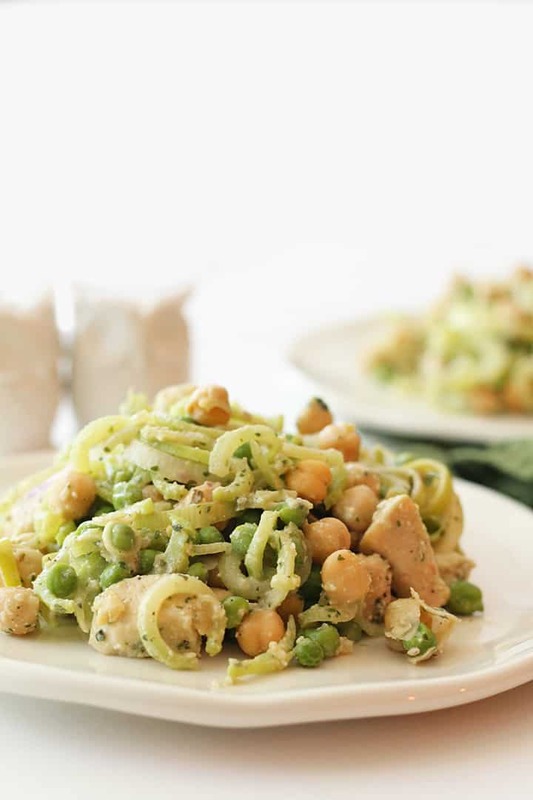 This is just the kind of recipe I've been looking for - lots of protein and flavor, and lower in carbs but plenty of veggies. The dressing sounds wonderful. I may have to sub garlic powder for the fresh garlic because raw fresh garlic leaves a really bad taste in my mouth. :-( Your regained creativity has helped to make my day. Thank you! WOW - Spiralized broccoli stems? WOW!!! BRILLIANT!!! and WOW!!! I am intrigued by that accordion cutting feature on the new spiralizers! !! Kohlrabi would also be perfect here. It's like a sweeter, milder broccoli flavour and comes in those convenient round shapes, perfect for spiralising! My boyfriend loves broccoli stems! Can't wait to try? Yeah. As a guy, I consider broccoli my 'first fave veggie' from way back.. like, age 6?!. As a pasta fiend, the thought of this recipe has my mouth watering. I just discovered zoodling, today. As the sometime cook in the family (we all cook, except 16 y.o. son - who actually likes to bake pies, but says he 'doesn't cook'!?) I just ordered an Inspiralizer for our family, and this just 'may' be my first recipe. Maybe I can even convince wifey-poo to eat garbanzos- he he he. (She doesn't like them). I'm excited to use the angel hair blade!! I think it will open up a lot of new options in my menu planning. 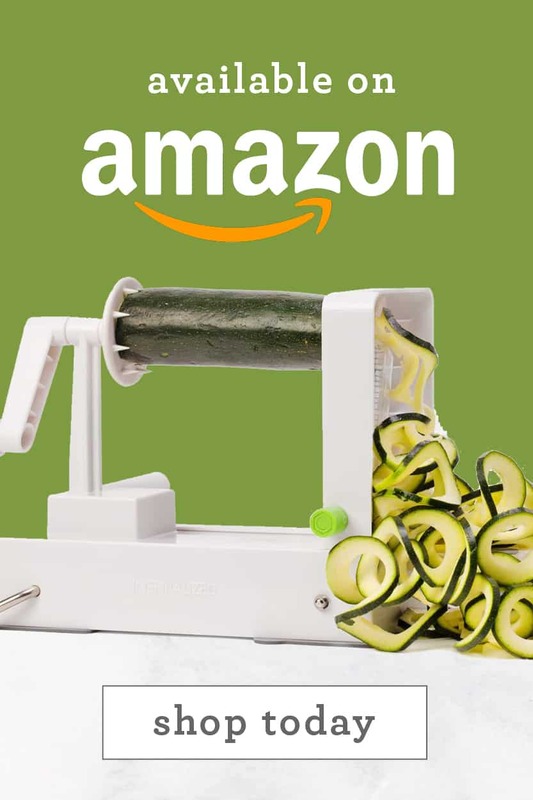 (unfortunately I loaned my spiralizer to my vegan best friend for a few months so she could try it out and I'm missing using it in my daily and weekly cooking!) It's fun to send her ideas, though! Thanks for the great ideas, Ali! Made for dinner last night...was delicious! Did you cook the leeks? Do you need to cook the leeks? Making this one this week! I am excited to try out the broccoli!! New to spiraling. Can't wait to try all the recipes. I just learned about your blog from honorcurves on IG - can't wait to try this recipe out! Tried this tonight and enjoyed it a lot. Believe it or not, I could not find broccoli stems, so I subbed 4 medium kohlrabi. They worked very well as a sub for broccoli. Also, used my Magic Bullet for making the dressing, when I realized that my food processor work bowl was way to big to work. Made this tonight and it's one of my favorite so far! (And that's saying a lot. I've tried at least 50 of your recipes). I used the broccoli florets in your Daikon fried rice and saved the stems for this one and it's delicious! I used goat cheese instead of feta because I prefer it and lime juice because I didn't realize I didn't have ane lemon on hand. It worked well! OMG spiralized broccoli!!!? This is genius! My fav veggie used as pasta. I think I'm in heaven now.